The Rational Ape: "An Open Letter to People Who Don't Exist"
"An Open Letter to People Who Don't Exist"
[…] I have had a lot of time to reflect on your position and I'd like to offer a few general observations that I've culled from my experience over the years - not to convince you to change your mind (which, I've discovered, is close to impossible) and not to judge your choices, but rather so that we can understand each other better and possibly "walk back" some of the clamorous dialogue. Certainly we can open by agreeing that all human beings should be respected and, assuming no egregious misdeeds, treated with civility. I have had a lot of time to reflect on your position and I'd like to offer a few general observations that I've culled from my experience over the years - not to convince you to change your mind (which, I've discovered, is close to impossible) and not to judge your choices, but rather so that we can understand each other better and possibly "walk back" some of the clamorous dialogue. Certainly we can open by agreeing that all human beings should be respected and, assuming no egregious misdeeds, treated with civility. That such an opening would be both factually wrong and hypocritical seems to me inarguable. The definition of a Jew, speaking religiously and not ethnically or culturally, is one who at the very least believes in the singular God of the Torah and does not follow New Testament scripture. Therefore, since millions of such people can be said to exist, one's assertion that, in fact, no “true” Jews exist would be quite flatly wrong (not to mention "true" Jews who can be otherwise defined culturally or ethnically). Notice that such a claim remains in error whether or not there is a god. I, as an atheist, can no more legitimately deny the existence of Jews than the rabbi can deny the existence of me. Since the rabbi claims to have had “a lot of time to reflect” on the position of atheism, and also claims to have been an atheist himself, one would be justified in expecting from him a proper representation of the position, instead of a straw-man drenched with gasoline and set aflame. 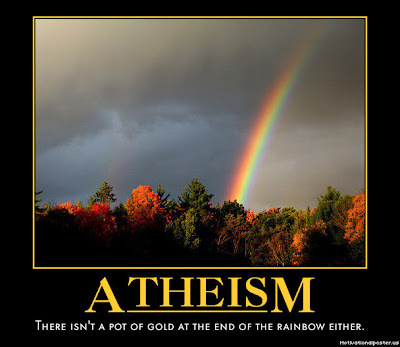 The definition of an atheist is one who disbelieves in God, or gods, and not one who claims to know with certainty that God, or gods, does not exist (though such a person would still fall into the category). Well, I don't have knowledge of the totality of the universe. I am, however, perfectly comfortable in saying that there is no credible evidence for leprechauns, that I therefore disbelieve in leprechauns, and, since I care about your dignity as a fellow human being, I also feel justified in arguing that your deeply-held belief in leprechauns is ill-advised and you should probably give it up. Though these books are indeed polemics against Christianity (as well as religion and supernatural creators more broadly), pointing this out does not constitute an indictment of any kind, in fact, this was their very purpose for being written. Furthermore, if the rabbi wishes to argue that the rebuttals of old theistic arguments which these books contain are “ill-conceived,” he'll have to explain why rather than merely declare it. The above sentiment is repeated again and again in the other literature, and this prominence leads me to cry foul. Either our “dear friend” has 1) not read the literature, 2) has read the literature but deliberately misrepresented it, or 3) his reading comprehension is so stunted that to make fun of it would seem almost improper. Maybe the latter (and only innocent) scenario is the case, but I doubt that very much. The thing is, of course, one of us would be right and the other wrong. Insulting his reader one last time, the rabbi suggests that “if Darwin himself could find room for belief in a God and stay faithful to his discoveries, maybe the common ground is much bigger than we currently imagine.” Except, of course, this is a lie. One too blatant to be mere oversight. Charles Darwin lost his faith in God, and said that for one to hold the position of ardent theism while simultaneously acknowledging evolution seemed “absurd.” Darwin only said he would not call himself that common misconception of an atheist which the rabbi so kindly straw-manned for us earlier. “We still have a lot to discuss. Let's do it with a caring heart, and open mind and a spirit of appreciation for our shared humanity. I would someday like to write for HuffPost on atheism too and would appreciate any contacts you could give me. Well stated. My thought on his article was immediately, "Who said atheists have to be certain there's no God?" As Richard Dawkins said, "We are all atheists about most of the gods that societies have ever believed in. Some of us just go one god further." Good work, thanks. The Rabbi's article was tough to read. Snakes may not talk and apples grow on apple trees. But these two facts do not make nonsense of the opening chapters of Genesis. The story can most definitely lead to enlightenment on different levels. Do a search: The First Scandal. @Robert: No, you're absolutely right, those aren't things that make nonsense of the opening chapters of Genesis. The fact that "God" created two human beings in His image, created every facet of their personality, gave them curiosity, then set them up for a test that they were absolutely certain to fail because he didn't give them the proper tools (ie, wisdom to know that they should not listen to a talking snake, because they were not given wisdom) not to fail the test, and then ultimately punishing them *and* their children for what they could not help--that is what makes the opening chapters of Genesis ludicrous. "not to convince you to change your mind (which, I've discovered, is close to impossible)". He's right, it is nearly impossible toto change an atheist's mind. A lot of us have spent a lot of time removing ourselves from being brainwashed by religion. Most of us didn't run across a point of issue and make a snap judgment to become atheist. We spent a lot of time, reading, researching, understanding and finally coming to terms with our lack of belief in something we were raised to believe by the people we trusted most in our lives. So yes, it is extremely difficult to change our mind. We left behind a fairy tail that runs the world and we choose to move forward rather than look back. Our only hope is to help other misguided people understand that there is still life, happiness and good in existence without religion and without their particular god.